I’m excited to say that we’ll be participating in the Jam this time around! Our team consists of one person for sound effects and tracks, and the other (me) for graphics and development. Because there’s two of us, we do the Jam, but we approach it like the compo: we make everything ourselves. We built something for the last jam but didn’t finish it in time to submit. It was a bummer, but it provides a warm fire under our butts to perform this time around. Goal number 1: get something submitted! This is a zero-player game. It’s a connection between the player, the computer science cellular automaton ( Conway’s Game of Life ) and a world of a simple bacterias. Each bacteria has it’s own “brain”. Player can modify it by adding active cells. Player can add 10 cells at the beginning. Each 10 game cycles is given another cell. In the brain if active cells extends 45% the bacteria will multiply – new bacteria will show. If the brain has no active cells bacteria dies. The “movement” of cells in brain cause movement of the bacteria. So if there is no movement the bacteria will stand still. I’ll be attempting to use LibCanvas this time around. Unfortunately, the documentation and some examples are still only available in Russian – but the engine looks too slick not to try. Hopefully I’ll have something working by Sunday night! A new Udacity course has just begun, which may be of interest to (future) HTML5 game programmers. The course has only just begun so there is not much content yet, just Unit 0 and Unit 1. Frozen Fractal is in again! It will be hard to top the success of I Am A Ninja (LD22, 50th place) and Cytosine (LD24, 31st place), but I’m going to try my best. 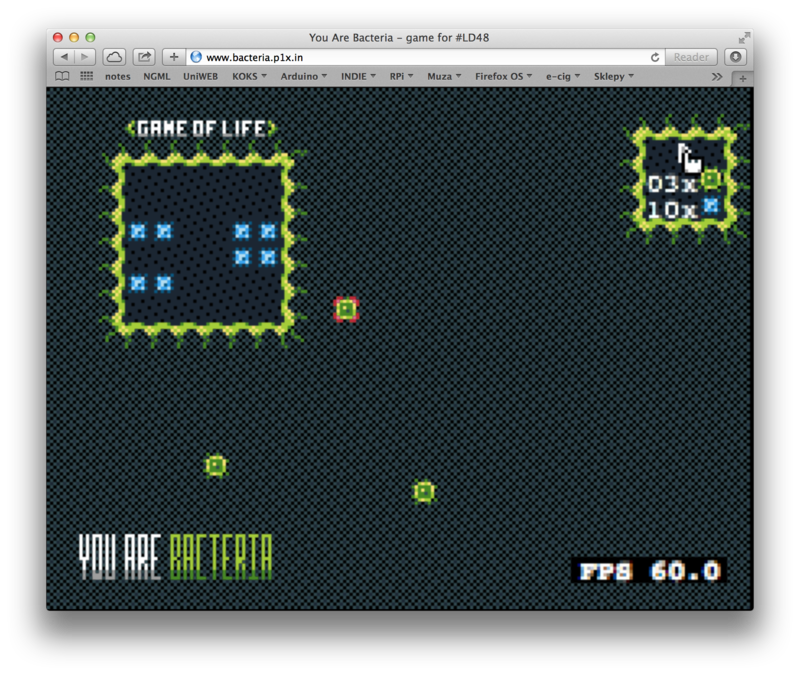 Like my last two games, this one will also be HTML5. I’m not yet sure whether it’ll be canvas2d or WebGL, but I’m leaning towards the simplicity of canvas2d. SCSS is compiled into CSS, using Compass for its CSS3 mixins (which automatically add vendor prefixes like -webkit- and -moz-). Inkscape SVG files are exported to PNG files. This makes for the quickest development cycle: just save the file, and refresh the page. I have three rough game concepts. Here’s to hoping one of them can be bent to fit the theme. Frozen Fractal joining LD24, and announcing a WebGL library! My previous <shamelessplug>entry</shamelessplug>, for LD22, being a resounding success, I’m now back for more! I used to be known as ThomasTC, but now I’m Frozen Fractal on here, frozenfractal on IRC, @frozenfractal on Twitter, and frozenfractal.com on the web at large. Like last time, I’ll be using HTML5 and canvas. Unlike last time, rather than plain 2D canvas, I’ll be using WebGL! It’ll be all fancy-like, with shaders and stuff. Maybe even 3D. This post is also a kind of base code declaration. “Kind of”, because I’m spending my free time this week writing my “base code” up into a nice open-source WebGL library! … opaque. It does not expose WebGL, but rather aims to wrap it in a straightforward way. … thin. Many Gladder classes are direct equivalents of WebGL constructs. … light. It has no dependencies, other than WebGL itself. … flexible. It tries to make as few assumptions about your application as possible. … unobtrusive. It does not change default behaviour of anything. … cross-browser. It abstracts away browser differences. The only similar library I could find was Glow, but I found its documentation lacking (read: nonexistent), the website yellow, and the code messy. I’d rather write my own bugs than inherit someone else’s; that way, I have at least a sporting chance at fixing them. Another drawback of Glow, as with many other OpenGL wrapper libraries, is that it still forces you to deal with OpenGL and its state changes. Gladder aims to abstract all hidden state away and let you deal just with objects and draw calls. Here is an example; there’s still one gla.enable() call, but no code to bind shaders, programs, buffers, uniforms, attributes… all of that is handled behind the scenes. The advantage of not exposing OpenGL at all is that the library has full knowledge of the GL state, so it can skip expensive state changes whenever possible. Since I don’t yet know what type of game I’ll be making, I’m forced to keep Gladder generic. To do that, I’m working top-down from code samples. First, I come up with something I’d like to be able to do, like render a spinning cube. Then I’ll write the code that I would like to result in a spinning cube being rendered, but it won’t work because I haven’t implemented those parts of the library yet. Finally I write the library code that does the actual work behind the scenes. I might iterate a few times, cleaning up the example code even further. I hope this approach will result in a straightforward, easy to use API. You can get Gladder on GitHub. Several important things are still missing (e.g. modifying buffer data, loading textures from images), but I’m going to push hard to make it usable before LD24 starts. Note that the interface is still in flux while I improve things and make them easier to use. If you would like to use Gladder for the compo or jam, let me know and I’ll focus a bit more on adding JSDoc comments and more examples. During the compo you’ll be on your own though, because I’ll be busy making a game! alone with myself – progress, almost there !! this is getting close to the end ! !, add the main screen, story screen changed the game over, killed some minor bugs of the viewport, now missing the soundtrack, sound effects and build the final map. It’s been many hours since Ludum Dare #22 started. To be honest, I was really hoping for teleportation. Time to get some rest. More fun tomorrow! I just realised I hadn’t actually committed to LD22 yet, consider that rectified. This will be my second LD48, I did a platform game last time, it turned out ok, but I spent far too long fussing over the graphics and nowhere near long enough getting content in. Hopefully with that lesson in mind this weekend I can come away with something much more complete.